Some health conditions may have reason to cause concern more than others when you reach a certain age. For instance, most seniors are concerned about Diabetes type 2. When you retire, you often cut down on activity, but continue to eat the same amount of food which you did when you were working. This on its own creates the ideal conditions to pile on the pounds. Many seniors often find they eat more when they retire. The reasons for that are simple. You spend an increasing amount of time at home which makes it easier for you to become bored. One solution for many is to reach for the cookie jar or spend your time going out for meals. Eating out is often a hobby for many retired folks, but should not be seen as such. It is better when dining out in a restaurant is seen as a special treat or pleasure. After all, it can be difficult to control what goes into your food when you dine out. Reducing the risk of Diabetes type 2 is not complicated and should never be made complicated. The risk of developing this common lifestyle health condition is surprisingly easy. However, there is not one solution and you need to take several different approaches. 1) Take a look at your diet. As you age your metabolism and digestion both change. This is down to hormonal changes which affect the liver. Starting your day with a bowl of oatmeal is a great way to control blood sugar balance. Supercharge your breakfast with healthy berries like blueberries and raspberries is another way to control blood sugar and introduce antioxidants to your diet. 2) Does exercise matter? Apart from diet, exercise is a great way to control weight. When you get older, it is best to exercise for a shorter period of time but do so more often. A walk before meal time helps to control both sugar levels and cholesterol balance. 3) Supplements for diabetes control – do they work? Micromineral supplements are the ones which work the best. Why? Many micro minerals have been removed from our food or are not present in the first place. For instance, white sugar has had all of the chromium removed. The function of chromium in the body is to help to control sugar. It seems hard to believe we choose to remove it. The reason we remove chromium from food is simply that it can color the food or sugar brown, and manufacturers would like their products to look attractive. 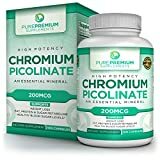 AN ESSENTIAL MINERAL FOR YOUR HEALTH: Chromium poses a very frequent deficiency in adults and this supplement will make sure you are getting exactly the amount your body needs. BOOST YOUR METABOLISM: Chromium Picolinate has been shown to boost fat, protein & carb metabolism, offering weight loss benefits and aiding in the digestion process as well. PURSUE HEALTHY BLOOD SUGAR LEVELS: Optimize your blood markers and especially your blood sugar levels with just one capsule a day. A STAMP OF PURE QUALITY: All PurePremium supplements are formulated right here in the USA in a GMP-certified and FDA-inspected facility. 100% MONEY-BACK GUARANTEE: Give our Chromium Supplement a try and if you are not satisfied with your purchase, get in touch with us and we will make it right. Chromium function in the body is to help the digestive process. It forms part of an active substance called GTF ( Glucose Tolerance Factor ). The same substance also contains niacin and the amino acids glutamic acid, glycine, and cysteine. A few years ago we did not know so much about GTF chromium but we have now discovered it supports carbohydrate metabolism. It stimulates the activity of the enzymes involved in the metabolism of glucose for energy. Simultaneously, chromium increases the effectiveness of insulin and makes it easier for insulin to handle glucose. When are chromium levels are low, the action of insulin is blocked. Both sleep apnea and obesity are linked to low levels of chromium in the body. Homocysteine – Can It Cause Diabetes? What is homocysteine? This naturally occurring amino acid is produced in the body. Many health experts now consider homocysteine level a better health indicator than others such as blood sugar and even cholesterol. Homocysteine has also been shown to play a major marker for disease development determining longevity and health throughout a person’s life. However, as we often eat too much protein, our homocysteine levels rise and this can lead to everyday health problems such as diabetes and heart problems. When we start to control homocysteine levels, we often find that our blood sugar is easier to control. With the right supplement, we can help to control the blood sugar level and achieve better cholesterol balance. When it comes to diabetes type 2 doctors only used to check the blood sugar level. Now, we know many other factors play a role and one of them is a person’s homocysteine level. Betaine is your go-to supplement if your doctor informs you that you have a high homocysteine level, In Europe, this supplement is available on prescription and is actively used to treat a range of health problems including diabetes. It is known to improve metabolism. After all, our metabolism and blood sugar level are linked. Betaine is the only supplement which has been proven to prevent the buildup of homocysteine. Levels can be slow to build-up but all betaine supplements should be taken for at least three months before the homocysteine is checked. We often underestimate the importance of magnesium. It is essential when it comes to many of the body’s processes which includes the release of energy from glucose and protein. Magnesium helps to promote the absorption and metabolism of other minerals such as calcium, sodium, phosphorus, and potassium. In other words, magnesium is the one supplement we should all be taken to boost our general health. As always make sure the supplement you are considering investing in is right for you. Supplements should always be used together with the right diet and exercise routine. However, supplements can be used to help seniors reduce the risk of developing diabetes type 2.